This book may require a special order. Please call us for price & availability: (316) 682-1181. In Crunchy Cons, Dreher reports on the amazing depth and scope of this phenomenon, which is redefining the taxonomy of America’s political and cultural landscape. 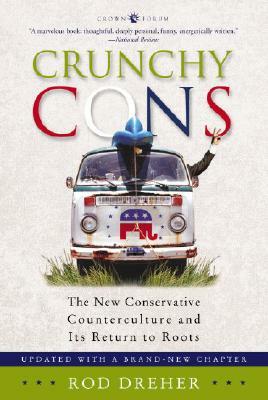 At a time when the Republican party, and the conservative movement in general, is bitterly divided over what it means to be a conservative, Dreher introduces us to people who are pioneering a way back to the future by reclaiming what’s best in conservatism—people who believe that being a truly committed conservative today means protecting the environment, standing against the depredations of big business, returning to traditional religion, and living out conservative godfather Russell Kirk’s teaching that the family is the institution most necessary to preserve. In these pages we meet crunchy cons from all over America: a Texas clan of evangelical Christian free-range livestock farmers, the policy director of Republicans for Environmental Protection, homeschooling moms in New York City, an Orthodox Jew who helped start a kosher organic farm in the Berkshires, and an ex-sixties hippie from Alabama who became a devout Catholic without losing his antiestablishment sensibilities. Crunchy Cons is both a useful primer to living the crunchy con way and a passionate affirmation of those things that give our lives weight and measure. In chapters dedicated to food, religion, consumerism, education, and the environment, Dreher shows how to live in a way that preserves what Kirk called “the permanent things,” among them faith, family, community, and a legacy of ancient truths. This, says Dreher, is the kind of roots conservatism that more and more Americans want to practice. And in Crunchy Cons, he lets them know how far they are from being alone.